Central Roofing is Columbia, SC’s roofing specialist! We’ve served many happy homeowners throughout Columbia and the Midlands since 2001. We’re a licensed, bonded, and insured company, with an A+ rating from the Better Business Bureau. 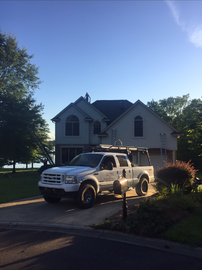 Central Roofing takes customer service and workmanship seriously, and standing by those values has helped us become one of Columbia, SC’s top roofing companies. Whether you need a small repair or a new roof entirely, we’ve got it covered! We’ve seen the size and shape of every roof imaginable, and we work with trusted manufacturers of the best shingles, sheet metal, and siding in the business. All our roofers have over twenty years of experience, and they know how to complete any roofing service on time, and within your budget. At Central Roofing, we enjoy collaborating with clients to help them realize their vision for a new roof, and increase their home’s curb appeal. Through friendly and professional service, we do our best to make the process of roof installations and repairs as smooth as possible. We can also perform a multitude of other home improvement services. Call us to handle seamless gutters, paint jobs, screen doors, porch work, deck additions, and more! Click here for a free quote! We work with your budget to get the roof you need at a price you can afford. Whether you need a small repair or a new roof entirely, we can take care of you.